Thorium Nuclear Power: Is It the Future of Nuclear Technology? It is estimated that fossil fuels will be non-existent by 2088. The world as we know it relies heavily on fossil fuels. Without fossil fuels, many things on which we depend in our daily lives – such as transport, electricity and heating – would suffer massively. In fact, we depend on fossil fuels and uranium, the latter of which is another non-renewable energy source, for over 80% of our energy. Uranium also has a short life expectancy. While this predicament is unlikely to seriously affect the current generation to the point where these resources are exhausted completely, the depletion of non-renewable energy properties is beginning to shape the planet as they become scarcer and more expensive. Renewable energy has, to an extent, helped to fill the gap left by the ever-decreasing non-renewable energy sources. However, they can’t be relied on for everything. However, thanks to the rapid development of thorium nuclear power, the dependence on fossil fuels will be lessened further in the not-too-distant future. The early signs also point to the possibility of thorium replacing current nuclear technology, although there is still a long way to go before that has a chance of coming to fruition. Identified in 1828 by a Swedish chemist, thorium was named after the Norse god, Thor (popularised by the Marvel superhero of the same name). 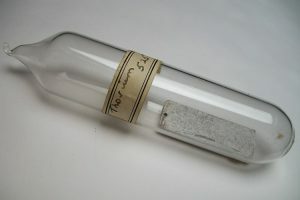 Thorium, which is characterised by its silvery white metallic look when in its pure form, is a basic element of nature. In small amounts, it is found mostly in rocks and soils. Thorium is also estimated to be three to four times more abundant than uranium. However, in nearly two hundred years since its discovery, only now has thorium become a serious candidate in the energy sector. Although it has come into prevalence recently as an energy source, this is not the first time thorium was considered for nuclear power. For approximately twenty years between the 1950’s and 1970’s, the US government researched the radioactive element and how it could be harnessed for its energy properties. Yet in 1973, all research into thorium was ceased by the US government. It opted instead to go with uranium. The reasons behind this choice included that research into uranium was more proven, and that the by-products of the chemical substance were a suitable component for nuclear weapons. Times have changed, however, and thorium is currently in fashion again. Now the safer aspects in relation to uranium are seen as a positive, rather than being undesirable during a time when nuclear weapons were in high demand (during the Cold War). As touched upon previously, thorium is a safer alternative to uranium. Not only is it clean and green-friendly, it is also safe because a thorium reactor can simply be switched off if it overheats. This, for example, would have prevented the recent nuclear disaster at Fukushima. There is also reportedly more than three times the amount of thorium in comparison to uranium. This abundant quantity would certainly play a factor in the thorium vs uranium debate, especially if recycling nuclear waste and breeder reactors don’t become a regular feature in the mainstream. Perhaps the key factor in thorium’s favour is that it is cheap. It is said that a ball-bearing sized amount of thorium could deliver all the power the average person would require in a lifetime. With positives, generally come negatives and that is still the case with thorium. Although the positives of thorium have been proven, the nuclear industry still has little experience with thorium in an operational sense. The industry itself is generally conservative and doesn’t like to substantially invest in anything other than the tried and tested method, so thorium is still an unknown quantity to some extent. Touching upon the previous point, arguably the biggest stumbling block to thorium becoming the leader in nuclear technology is through a lack of backing. The positives of this energy source outweigh those delivered by uranium, but a substantial amount of time, resources and funding is necessary for thorium to be integrated as the standard for nuclear power. For that reason, ousting uranium from the position it currently occupies would be tricky. When will thorium be used as a nuclear power? Despite being in its infancy when it comes to being consumed for its nuclear power benefits, thorium is quickly becoming the option of choice for the reasons listed above. In both India and China, they are dedicating vast resources in developing a thorium-based nuclear reactor. India has already designed a prototype for the world’s first thorium reactor, and they intend to have it fully operational by 2016. It goes without saying that India’s plans for thorium energy are certainly ambitious. By 2050, they hope that 30% of the country’s electricity requirement will be provided by thorium reactors. “This will reduce our dependence on fossil fuels, mostly imported, and will be a major contribution to global efforts to combat climate change,” expressed Dr R K Sinha in an interview with India Today. The big question is: will nuclear power be revolutionised by thorium energy? At this point, it is too early to say for sure. Yet the early signs are certainly encouraging, and if more countries adopt the enthusiasm and forward-thinking approach that India and China have displayed respectively, then the growth of thorium nuclear power will continue at a rapid rate. Based on the benefits provided, only a lack of time and investment will cause thorium energy to not overtake uranium in the future of nuclear technology.